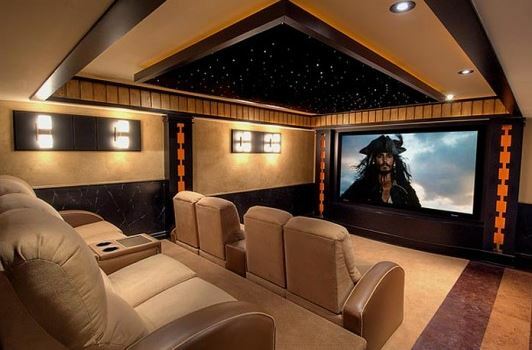 How To Setup A Movie Theater In Your Home? Many years ago, the only way to have a true movie experience was to buy tickets to see the movie on the big screen. However, movie tickets are not as cheap as they once were and people are gravitating towards watching their favorite movies in the comfort of their own homes and saving the extra costs associated with going out. Nowadays, we have a lot of new technology that allows us to set up a movie theater in the comfort of our own homes. It might seem like something really expensive, but you can actually save a couple of bucks and do all of this on the cheap or for a very affordable price. Yes, it might be an expensive once off purchase, but the long run is what counts. How To Setup A Movie TheaterFor An Affordable Price? The one thing that all movie theaters use to display the movies is a projector and nowadays, they can be fo8und in abundance. With so much competition, it is no secret that brands are trying to amp up the quality and reduce the price as much as they can. Projection Quality: The first thing you will need to look at is the projection quality. It is no secret that we are moving into the era of Ultra HD, but a standard 1080 HD projector should do the trick, for now, to ensure you have an excellent viewing experience. Brightness: The brightness does not seem like something important, but you might not always want to view your movies or features at night. The brightness of the projector is generally indicated in the form of lumens. Anything around 2000-lumens should be more than enough to watch your movies in daylight. Projection Size: While you might not really need a massive projection size, having a large projection size will make a huge difference to your experience. In theaters, we generally have massive screens and commercial grade projections that will allow you to have the best possible viewing experience. To simply recommend one projector from the multitude of projectors is not that easy. However, Optima is one of those brands that spend a lot of time in the design and they actually produce great projectors that offer value for money. Their projectors will range in size and projection quality. Screen Size: The screen size should actually match your projector size and quality. This will make it much easier to have the complete setup ready and you only need to aim or direct in in the direction of the screen. Type: You generally have 2 types of screens to choose from. The roll-up screens are the most common and they will simply be pulled down from the wall, but can be rolled back up once done. Alternatively, you can choose the permanent screen to ensure you don’t have as much to do before watching. Now that you have everything bought, you need to find a suitable place to set it up. Depending on the layout of your home and where you find the most comfort, you will be able to set up your screen for your viewing experience. The setup of the projector might be a bit of an issue if you don’t have much in terms of skills to actually mount it. However, many projectors can work in any different form and you might even be able to set them up on a table facing the screen. With a couple of tries, you are bound to find the right angles and maneuver it to fit the screen the best way. On a side note, you don’t need to always have it set up in your living room, the bedroom can also work efficiently when you want to sit or even lay in your bed while watching your favorite movies. If you really want to have the best comfort, I would recommend adding a good sofa. You might even have one with massage features to help you relax and distress from the day. Now that everything has been set up and you know how to do it on your own, you can start looking for a few of the cheap projectors that will meet all of your needs. Once all has been done, the time to enjoy your hard work will finally be worth all the trouble. Let us know how you have set up your own movie theater system in your home and if we might have missed any other important steps that you would have included. If you have great product suggestions, we would love to see which projectors and screens you think are the best.